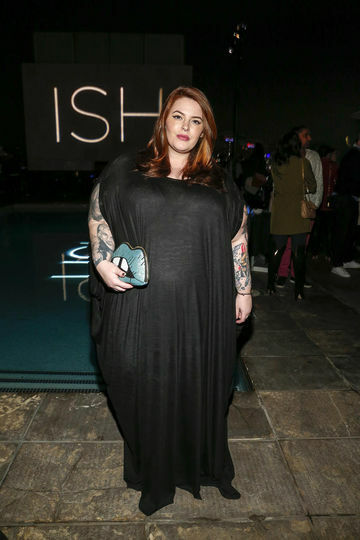 Pregnant model Tess Holliday slams the haters in a truly epic fashion. Tess Holliday is a gorgeous model who happens to wear plus-sized clothing. She's also a soon-to-be mother and a warrior against the nasty fat-shaming that has sadly become all too common on social media. Holliday recalls the time immediately after she announced her pregnancy, admitting that the hateful comments came soon after. "Funny enough, [my fiancé] Nick and I had a day of peace when we announced we were pregnant," she told TODAY. "We literally had one day of peace where everybody was nice to us on the internet. It felt like The Twilight Zone.'" But according to the model, that surge of positivity didn't last long. Tess, who is eight months into her pregnancy, said she's faced tons of comments throughout her gestation—and while some of them have remained positive, many have been hateful, ignorant and just plain mean. The only good thing about this situation? The fact that Tess knows how to slam the haters in the most epic way possible—and raise an important point about the individual nature of pregnant women and their bodies in the process. She posted a Facebook photo showing off her body along with a caption about the comments she's recieved. Tess is no stranger to dealing with haters. She's even had people comment on her photos with whale emojis, which is just so wrong on so many levels. "People would say there was no way I could carry a child and be healthy, or there was no way I could conceive in general because I'm too big. I have human reproductive parts! I was amazed by the audacity of what people are capable of," she said. "I hope one day plus-size women don't feel the pressure that we do, because sometimes you feel you're trapped in this never-ending negative cycle because of other people's issues. I believe in trying to find the best in every situation."